I’ve been working on my attitude of late – too much negativity was being focused on, not enough positive. A conversation with a friend, dinner with Chris, and preparing for the March Slice of Life challenge all served to remind me of the awesome stuff all around me. The small moments that are often overlooked. · My students came in this morning still talking about the fact that I went roller-skating with them in PE the day before. Twenty minutes out of my prep seems like a small price to gain this much positive feedback. Planning to go again with them Wednesday. · I love teaching siblings in families. I taught a boy named Jacob years ago. At the time I did “Star of the Week” and the kids would bring in a book for me to read. Jake brought in Everybody Poops, mainly because he didn’t think I would read it. Challenge accepted. Love that book. His brother, Josh, is in my class this year and brought it in today. I gladly sat down on the carpet to read it with my students. A one-hump camel makes a one-hump poop. A two-hump camel makes a two-hump poop. Only kidding. Great way to begin the day. Lots of laughter. Thanks, Josh! · Mailed a book to a friend at lunchtime. Margie has been beyond generous with me this year. It made me smile to send a book on to her. · During lunch I got to catch up with two teachers on my floor. One happens to be very dramatic when acting out conversations. Any time we catch up I typically find myself bent over, gasping for breath as I laugh. Rejuvenating. · At the end of the day I got to catch up with another colleague as we discussed Diane Ravitch’s recent post about CCSS. While the topic wasn’t uplifting, I realized how grateful I am to have folks I can have these conversations with. I left our chat feeling positive. There is a lot of good in education – my colleague is proof of it, as are so many of you. · Liam and I headed to run errands for my mom. We made jokes the whole way to the store, her house, back to the store to get something else for her, back to her house. As he and I made silly faces in the rearview mirror, I realized I was calmer than I had been in weeks. 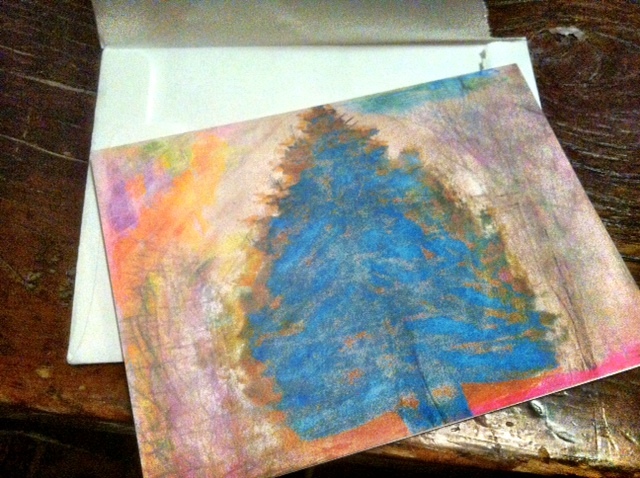 · I came home to this beautiful card from Brenda Power with a note about a recent article I’ve written for Choice Literacy. I don’t think it is any secret that I would love to write a book one day. Last year my resolution was to begin to move toward that goal. This blog – and writing regularly was one step. Trying to write for Choice Literacy was another. I finally began doing that in June and have written about twelve articles for them since then. I do feel like I’m headed in the right direction. Notes from Brenda really brighten my day. 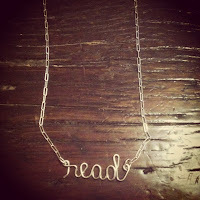 · A dear friend sent me this beautiful necklace in the mail. She gave me another gift by thinking I was turning 35 on Wednesday. That made me smile. 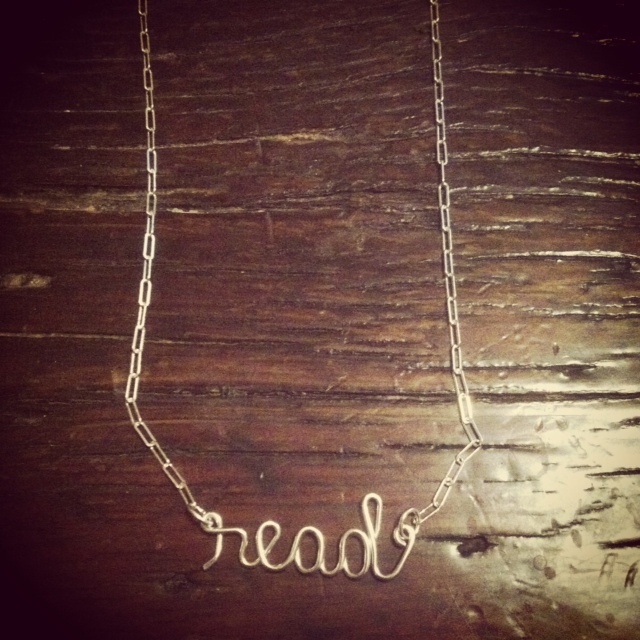 The necklace was just the kindest gesture. Thank you. And as I sat down to type this all out, the smell of cupcakes wafting out of the oven – ready to take to school for my students tomorrow, I listened. Bally was pacing the kitchen, looking for scraps of food. Luke and Liam were playing in the living room. My iPhone was beeping from texts from good friends. Chris came in to ask me a question. I had to smile. Life is good. When I’m in my grouchiest moods I just need to stop and realize that. I look forward to tomorrow. I’m thinking turning 39 is going to rock. It will be a good year. Friday begins the Slice of Life challenge. Last year was my first year having a blog – my first year participating, and I loved it. I credit that challenge to helping me see stories all around. I can’t wait to get going again. This year I’m mixing it up and having my class participate as well. We will be doing their part of the challenge old school – in journals. I wrote this poem to share with them and hope that they will find some excitement in this challenge. Enjoy! March is going to be about writing in our classroom. A snapshot of your day. Put away your fantasy stories for this month. This month is about you. Wake up in the morning and grab your journal. Steal a few minutes between classes. Once a day – you find the time that works. I’ll share my writing with you each morning. I will hand out rewards along the way to those who stick with it. Doing a mash-up of two blog posts today. One, Jen and Kellee’s wonderful It’s Monday! What Are You Reading? World Read Aloud also is doing a blog post this week on your reading life. So, being a multi-tasker I decided to make a video that would fit the needs of both. Hero’s Guide to Storming the Castle is listed on Amazon with a release date of 4/30. Teri writes this morning about the insanity that is AR and Lexile. Specifically she focuses in on these programs and makes some observations about them. One of which deals with the increase in teachers who do not read. Is that a result of programs such as these? Here’s the thing – if you are reading this blog I am likely preaching to the choir. Either you are related to me (Hi Mom! Hi Chris!) or you are an educator (or writer) who is reading someone’s blog on your own time. You are likely the opposite of teachers who don’t read. Your "to read" stack probably looks something like mine, overtaking your room, becoming a death trap to anyone who walks by and jostles the precariously placed books. So do I need to write this for you? No. But I do need to put this out there, so please bear with me. When I first began teaching in my district almost fourteen years ago we had AR. I remember my first class used it to take a quiz on books they read. I didn’t require it but the librarian did for state award books. I clearly remember teaching a whole class novel unit on Richard Peck’s A Long Way From Chicago. This book takes place in the county I teach but never names the town (Cerro Gordo). We hung a map in the room of our county, marked the spots Joey and Mary Alice traveled to. We read it together, discussing the time period. I read the last part to them. When Joey’s train passes Grandma Dowdel’s house on his way to the Army Air Corps, the whole house is lit up and Grandma is standing and waving at the train. Knowing she can’t see Joey, but that he can see her. I sobbed reading it to my students, a moment I will never forget. Later as one student, my cousin who was in my class, sat down to take the test – I sat with him. I wanted to see what types of questions this book would ask. Morgan and I talked as he took it. We were puzzled as he read the questions to me. What we found beautiful and important about the book was not touched on. Some vocabulary (bustle, for example) was given more weight than theme, relationships, inferences. I remember leaving the computer confused. That test did not show me that my students truly understood the book, but my conversations with them did. What was the point in it? Over the years I grew smarter. While I never required the AR tests I began to discourage them even from taking any. For the state award books, I would conference with them and send a note to the librarian saying that they had read them. 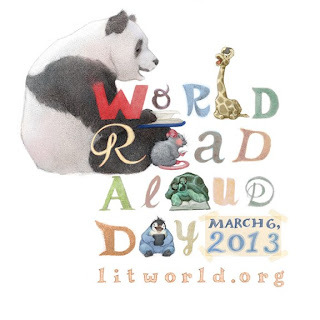 I encouraged my students to read widely and I would conference as often as possible. Reading conferences – absolutely critical to the success of readers in my classroom. Conferring with my students allows me to find out how they are connecting with a book as they read them. Is it out of their reach? Are they having a hard time getting into it? A ten-question test at the end is too late to help a poor match between book and child. Also, conferences help me to get to know my students better. And I never stress if I haven’t read the book, the student is in the lead in the conference anyway. They just need to teach me as I flip through their book. I will admit here that my biggest problem with conferring is that I take too long. Once we start talking time slips away and I don’t get to as many kids as I’d like. This is something I’m working on. I have no personal experience with Lexile other than they print a child’s Lexile score on our state tests. No idea how they get that score at all. Honestly, I wasn’t even aware that it was there until another parent asked me about it. Just glanced right past it when I looked over my own child’s scores. The problems I have with Lexile are much the same as AR. I think it narrows the options for a child’s independent reading and can hamper any joy a child might find in reading for pleasure. I know I read below my Lexile every single day. Who cares? Beyond the fact that these programs squash a love of reading, send kids to a narrow selection of books they can read from, and make it that reading is a chore, I have another issue. A bigger issue – or two, as a matter of fact. One, these programs cost money. Lots of money. Is this really the best use of funds? How about we spend some money on books in the classrooms? Or the libraries for that matter. Crazy talk. As for teachers and reading, I cannot imagine trying to teach reading yet not reading myself. How do you connect children to books if you do not read? I inhabit a world of books. Because I read I know what it is like to struggle to get into a story. Because I read I know how your heart breaks when you read a book. Because I’ve read The Knife of Never Letting Go or See You at Harry’s or Hattie Big Sky, I know to hug a kid when they come up to me and whisper, “Manchee” or “Charlie” or “Mattie.” I connect to my students through books. So what is my reading program? Books, kids, and a teacher who reads. Pretty simple, but effective. No need for expensive programs. No need for comprehension tests that only test a surface level of comprehension. No need for a leveled book. Just read. And a side note – the same holds true for writing. See Penny Kittle’s beautiful words HERE. Some weeks – some days – are easier than others. This was not one of those easy weeks. One, my husband has been getting more and more interested in education. To the point I am explaining testing, standards, funding, etc. You know how we, as educators, already know certain things don’t make sense, but then you explain it to someone out loud and all of the crazy items that are our every day reality are verbalized? Yep, that’s where I was at. Trying to explain why we have certain tests. How we are compared to countries like Finland. The policies on testing students with severe disabilities. It isn’t that he wasn’t asking good questions that was the issue. The fact that he is not an educator, but saw the complete insanity in some (most) of these mandates yet no politician can, made me a bit crazy. Then I read this letter drafted by the Illinois Principal’s Association and I got more irritated. (Click HERE and then on the link below the line that reads: Attachments.) I mean seriously, let’s look at all of the unfunded mandates. I think a reality check might be in order. And then Luke – my oldest – was sick. All. Week. Long. Low-grade temp and headache. My husband and I alternated staying home with him. I had the pleasure of teaching all day and then doing 1-2 hours more of test prep with him every night. And I don’t begrudge his teachers in the slightest for sending it home. They are trying to prepare him for something that is insane, and only going to get worse. · Fifth Grade boy humor. "Mrs. S, did you know Uranus is a gas giant? That Uranus is blue? That Uranus is lazy because it spins on its side?" Tears streaming. · Josh asking Riley what page he was on in Dark Life and then high-fiving him for being on the same page. Both of them huddling up to discuss the book at a table. · A former student being chosen as the middle school student of the month. One of the hardest workers with the best attitudes I have ever taught. Can’t think of anyone more deserving. And a huge Babymouse fan to boot! 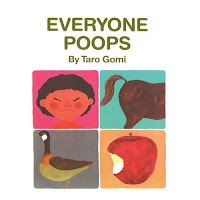 · Having to talk to my intervention class about books as I held a Kleenex to my nose for a freak 20 minute nose bleed. One student smiled at me, while summarizing Paulsen’s My Life in Dog Years and told me that “this” was a first. · Book talking numerous books purchased at Anderson’s over the weekend. They all now have waiting lists. · Having my students share what stories my mom tells when she subs for me. · Writing a poem about my grandfather’s dog, Cookie. Having an amazing conversation with my students about why we make the choices we do as a result. I ended my shortened day today (home now with Luke) by lying on the carpet next to a student and discussing the merits of Rick Riordan’s books and which ones we liked best. I was completely relaxed. As I sat in reflection I realized that there was a quiet peace in the room. Twenty-four kids – large eleven-year-old bodies – were spread around the classroom. You could hear quiet conversations about books, pages turning. And I came back to this. As much as I’d like to, I cannot control what happens outside of my classroom. I will continue to speak up for what I know is wrong. But this classroom? I can control what it is like. I choose this. I choose conversations over books, silly lessons on what Parkour is (thanks boys), discussions with my girls about how we need to remember the lesson of the exclamation mark when we enter middle school, belly laughs where the tears come, tears from true feelings, and the feeling of peace I get while lying on the carpet sharing thoughts around a book. The negative stuff can bring me down. These fabulous faces and these real experiences remind me of what is really important. And that is what I’m taking with me into this weekend and all of the days to come.